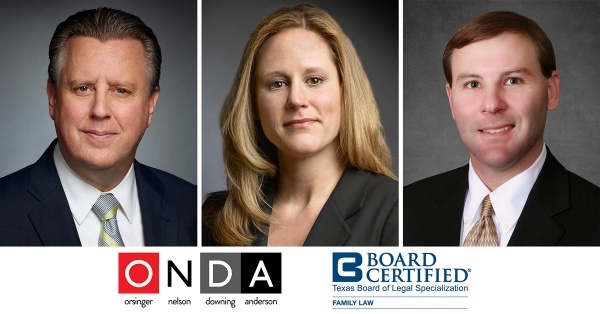 DALLAS – The Family Law boutique Orsinger, Nelson, Downing & Anderson, LLP, congratulates attorneys Chris Oldner, Holly Rampy Baird and R. Porter Corrigan II for earning Board Certification in Family Law by the Texas Board of Legal Specialization. “We could not be more proud of Chris, Holly and Porter for receiving this well-deserved recognition,” says firm partner Keith Nelson. Thirteen of the firm’s 17 attorneys are now board certified in Family Law, a distinction earned by less than 1 percent of Texas attorneys. In addition, Mr. Oldner is the second firm attorney certified in two practice areas, with his other certification being in Criminal Law. A former state district court judge, Mr. Oldner joined the firm in 2017 after serving three full terms in the 416th District Court in Collin County, where he presided over criminal and civil cases, including Family Law bench and jury trials. He earned his law degree from the Texas Tech University School of Law and is a graduate of Baylor University. For more information on Mr. Oldner, visit https://www.ondafamilylaw.com/attorney/chris-oldner/. A recent honoree on D Magazine’s 2018 Best Lawyers Under 40, Ms. Baird handles divorce and complex property division, modification actions, enforcement actions and child custody litigation. She has also earned spots on the Texas Rising Stars list of the Top 100 Up-and-Coming lawyers and the Top 50 Up-and-Coming Women lawyers. For more information on Ms. Baird, visit https://www.ondafamilylaw.com/attorney/holly-rampy/. A six-time Texas Rising Stars honoree, Mr. Corrigan has extensive experience in Family Law issues, such as divorce and child custody cases. A native of San Antonio, he is a graduate of St. Mary’s University School of Law and The University of Texas at Austin.